The ANS Kata-Gi is custom-made wooden pedicure spa that features luxurious looks and a contemporary design. The stylish ANS Kata-Gi features an adjustable footrest, polished chrome hardware, stainless steel shower hose, built-in LED color therapy light, FREE matching pedicure stool. The ANS Kata-Gi also includes a premium ANS massage chair of your choice. The ANS Kata-Gi is custom-made and custom-built with your choice of custom wood-laminate colors. You will earn 2099 Points for purchasing this product. The elegant ANS Kata-GI is a customizable wooden pedicure spa handcrafted by our expert carpenters using only the highest quality components. This beautiful pedicure spa is custom-made and custom-built with your choice wood laminate colors. For quality assurance, each ANS Kata-GI is designed and assembled here in the USA. The ANS Kata-GI is also ETL-certified for safety and is carefully tested by trained technicians before leaving our location. Each ANS Kata-GI comes equipped with the exclusive ANS Liner Jet that provides the soothing whirlpool effect that customers love. 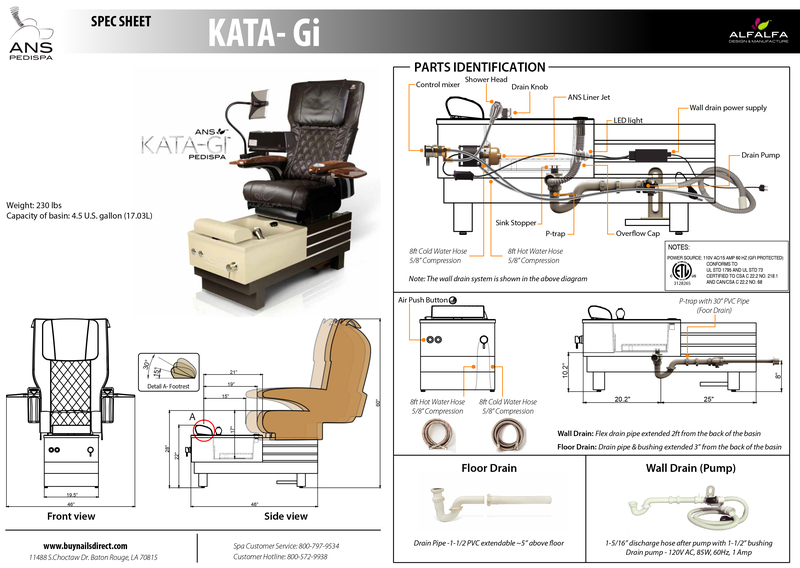 In addition, the ANS Kata-GI includes a premium ANS massage chair of your choice.